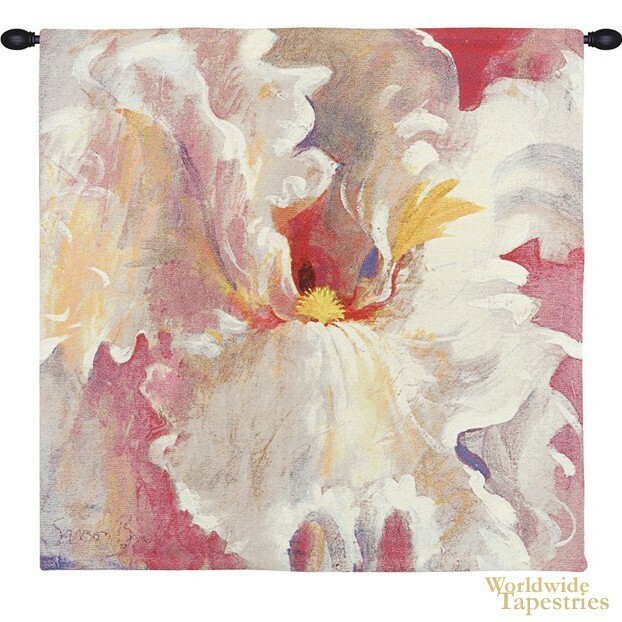 This floral contemporary tapestry "Smallest Of Dreams" is by artist Simon Bull who is now regarded as one of the most sought after artists, with his works collected by royalty, presidents, celebrities, and museums as well as private collectors. His works matured and he came to a realisation of the impact of his works when Simon had an exhibition in London where people told him of the impact his works had on them, which is an emotional impact to their core. His use of color and transport of people to a dreamlike state and place is a hallmark of his works. Here we see wonderful scene of pinks, orange and white tinged with blues to paint a scene of flowers with both intricacy and subtle detail as well as an overall dreamlike state. This contemporary floral tapestry "Smallest Of Dreams" is backed with lining and tunnel for easy hanging. Note: tapestry rod and tassels, where pictured, are purchased separately. Dimensions: W 37" x H 37" W 55" x H 55" W 21" x H 21"